Now, I love Dorie Greenspan. I have great admiration and love for her, and am such a big fan of her books and her recipes. All the recipes that I have tried so far from her latest book, Around My French Table, have turned out wonderfully. 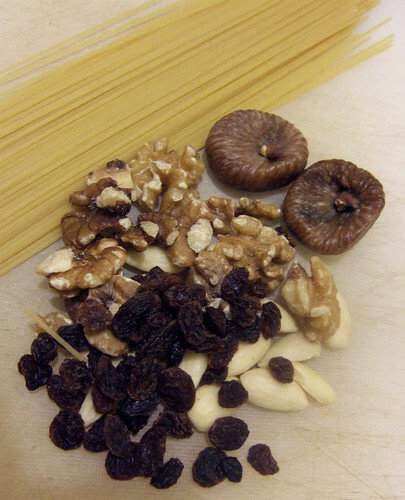 So I had my doubts when I was reading through the latest "French Friday" recipe, Beggar's Linguine Nuts, dried fruit...and pasta? I do like all those elements individually, but I had a hard time trying to conceptualize all of them together in my head. But as always, Dorie never disappoints and this turned out to be a surprisingly good dish. 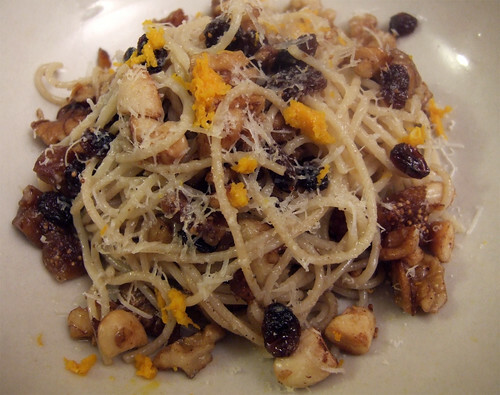 The sweetness from the raisins and figs, the toasty crunchiness of the nuts...they work so nicely in the browned butter and tossed together with pasta. Don't skip the bit of orange zest to finish it off—it really brings the dish to a whole other level. Dorie's recipe called for pistachios and almonds, but I swapped the pistachios for walnuts as I couldn't seem to find my stash of pistachios. I also soaked the raisins and figs in some boiling water for about 10 minutes to quickly plump them up. I'm thinking of next time doing a slow-soak in some booze next time. Spaghetti was used in place of linguine. This is such a fast and easy meal and so elegant in its simplicity. I'll definitely be making this again when I need to throw together a quick meal in less than twenty minutes. You too can join in the fun and cook along with Dorie Greenspan's Around My French Table. 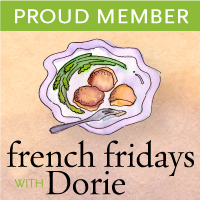 Just pick up a copy of the book, sign up at French Fridays with Dorie, and start cooking! Mardi @eatlivetravelwrite March 11, 2011 at 7:14 a.m.
Wasn't this a great dish? I am thinking of using my chocolate pasta next time round to make a dessert version of this! Adriana March 13, 2011 at 12:49 p.m. I loved how easy it was to put together as well. Cher March 13, 2011 at 3:50 p.m. It was great how easy this one was to put together! Glad it was a hit for you. And you are right - the orange zest just took this one over the top. amanda @ fake ginger March 13, 2011 at 4:34 p.m.
Allison March 13, 2011 at 5:22 p.m. Excellent point that it's a fast and yet elegant in it's simplicity. It would be great to keep in the back pocket when you want to impress someone last minute. I hadn't filed it that way in my head before. Thanks!